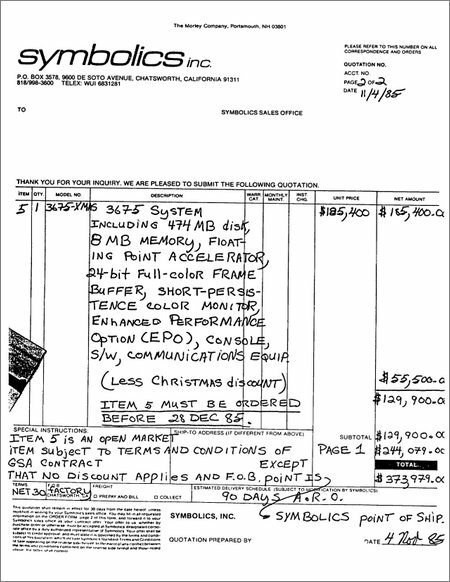 Henry Lenzi sends “photographic evidence of why symbolics went down,” a sales quote from 1985 for an 8 MB RAM, 474 MB disk Symbolics 3675 that comes to $129,900 (after a “Christmas discount” of $55,500). I think it's actually 8MW (megawords), not MB. :-) I'm sure they're charging by the pound. The machine had a 36bit architecture + ECC bits. Everything was large (also physically large): a 474MB disk in 1985? What do you think did that cost at that time? 24bit color framebuffer + monitor. Plus b&w framebuffer and screen In 1985? The machine was high-end, with 14 (IIRC) expansion slots and space for 8 (IIRC) disk drives. Yes, I'm guessing that this machine was an excellent value for its time. I don't even know if there was any other comparable system available. One may believe that failing to move to commodity hardware is what killed symbolics, but in 1985 I don't think there was commodity hardware that was capable enough. $130,000 for a 24-bit video workstation in 1985? Sounds about right. I don't think SGI's stuff was any cheaper back then. Actually if that price included the S-Graphics software, it's a bargain. I think the Wavefront software alone was around $100,000 a seat when it was introduced (late 1984). I wonder what the Enhanced Performance Option (EPO) provided? well, one think that killed Symbolics Inc. for sure was their real estate mis-investment. The EPO? That's an IFU (instruction fetch unit): a processor board for instruction prefetching. Remember, the machine did not have a microprocessor. be on one or more of these boards. Imagine one (!) board with 512KW, later with 1MW. Maybe the same thing which killed them killed Connection Machines -- less US government purchases? That, and Unix knew what it was doing, taking root in orphaned machines like a virus, as Kernighan/Mashey's 1981 paper explained. Because it was so inexpensive to obtain/maintain and was able to support other machines. There actually is one "Lisp machine" which succeeded wildly. Which no one ever brings up. Emacs. For much the same reason Unix succeeded, no doubt. It was the christmas discounts that did it!